It was March 6, 2009. 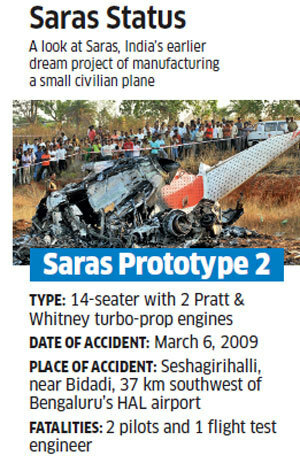 A 14-seater prototype aircraft called Saras Prototype 2 crashed during a trial flight in the outskirts of Bangalore, killing all three crew members — two pilots of the Indian Air Force and a flight engineer. During the investigation, the cockpit voice recorder disclosed the commander calling out, “aircraft has departed”, just 10 seconds before the crash, indicating that the plane had gone out of control as soon as it took off. 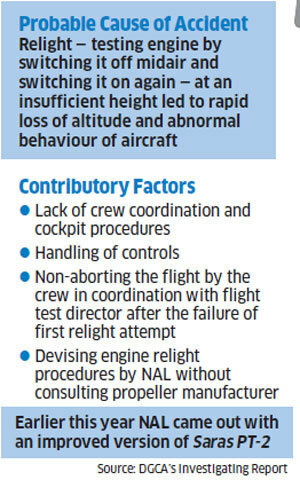 The 75-page investigation report pinpointed human errors, but did not spare the manufacturer of the plane, Bangalore-based National Aerospace Laboratories (NAL), for devising engine relight procedures — a midair test that involves switching off an engine before switching it on again — without consulting the propeller manufacturer MT-Propeller of Germany. The plane had lost altitude and crashed, but the tragedy had a direct fallout: India’s dream project of manufacturing a small civilian plane, the Saras — the Sanskrit word for crane — was stuck in limbo. By 2016, NAL, the agency that comes under the administrative control of the Council of Scientific and Industrial Research (CSIR), announced that its Rs 300 crore fund for the project had dried up, forcing it to suspend Saras for the time being. It was a project that began in 1991. In fact, there was another prototype — the Saras PT, which flew successfully many times since 2004. It has been modified as the 14-seater Saras PT1N and flown again earlier this year, for a surprise trial. Something much bigger than Saras is in the offing now. Nine years after the PT-2 crash, the Centre is thinking of indigenously manufacturing aeroplanes for civilian use. Earlier this week, a 21-member jumbo expert committee, headed by the civil aviation secretary, was set up to look into the various aspects of manufacturing planes and helicopters in India, apart from finding ways to upscale and diversify production of Aero-components. Significantly, this is the second panel being set up in the last two and a half months; the first was headed by the ministry’s economic adviser, Vandana Aggarwal, with a mandate to give a road map for creating a special purpose vehicle (SPV) to develop what it calls regional transport aircraft, or RTA. The need for such a segment has been increasingly felt after the government rolled out its UDAN scheme for regional connectivity a couple of years ago. “What’s being discussed is the feasibility of manufacturing aircraft of 19- to 100-seater,” an official connected to the panel told ET Magazine, adding that its recommendations would be ready by the end of this month. This panel, constituted on August 30, has four members — a general manager-ranked officer from Hindustan Aeronautics Limited, a group director of Aeronautical Development Agency (ADA) and senior scientists Abhay Pashilkar and RV Venkatesh, both belonging to NAL, the creator of Saras. Rs 80 crore is earmarked for the purpose of designing the regional transport aircraft manufacturing project. “The Government of India is fully committed to the development of commercial Aero related manufacturing in India,” Minister for Civil Aviation Suresh Prabhu told ET Magazine, adding how two committees would engage in deliberations simultaneously. “Both the Government of India and Indian industry are serious (in manufacturing civilian planes),” he says. Though information on a likely road map for manufacturing aeroplanes in India is still sketchy, two things are amply clear. First, unlike the earlier avatar Saras, which was a small, 14-seater, this round of manufacturing may embark on building relatively bigger aircraft, up to 100-seater and even more. There are 1,358 aircraft in India, including private ones and those used for training purposes, as on July 12, 2018. There are 620 aircraft of scheduled Indian operators. Of these 79 planes have less than 100 seats. In that category, 70 aircraft have 70 seats and above. The smaller ones include three 50-seater CRJ-200 aircraft flown by Zoom Air, two 48-seater ATR 42-300 of Alliance Air and four 18-seater Beechcraft 1900D planes of Air Deccan and Air Odisha. 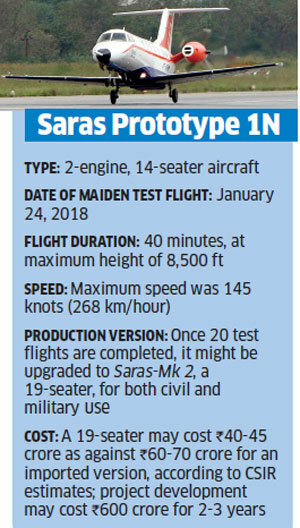 The data, compiled by the Directorate General of Civil Aviation (DGCA), throws up the question whether there will be any demand for a 14-seater, Saras-type aircraft — something that was conceived back in the 1990s, even though the government tries to revive the project. Airlines in India, which foresee growing air connectivity to smaller cities, may prefer 50-to-70-seater planes rather than smaller ones. However, state-owned Hindustan Aeronautics Limited (HAL) is scouting for buyers for its 19-seater Dornier-228, hitherto flown only for military use, saying the aircraft is cheaper and has low maintenance costs. 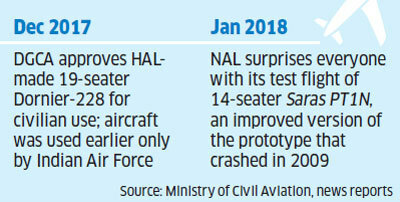 It was in December last year that HAL obtained licences for the use of Dornier for civilian purposes. Second, unlike in the past, the government may engage private players — either foreign or Indian — for manufacturing aeroplanes. It’s unlikely that the aircraft will be a pure NAL-CSIR venture like the Saras, says an official in the know. That could propel the government into a turbulent zone. Already, the partnership of Dassault Aviation and the novice in the field, Anil Ambani-led Reliance Defence, in the Rafale fighter jets deal has become a political hot potato. “We will follow due diligence. The decisions of both the expert committees will go for inter-ministerial consultations and also the approval of the cabinet,” a civil aviation ministry official said on condition of anonymity. 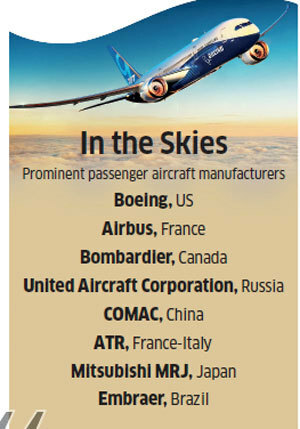 Already, pressure is mounting on India to plunge into the manufacturing of civilian aeroplanes after China came out with models such as COMAC C919, a 168-seater, narrow-body jet, which many aviation experts happily compare to AirBus A320neo and Boeing 737 MAX. The aircraft is likely to be used by China Eastern Airlines by 2021, according to various news reports. In India, sarkari hurdles are more complex. 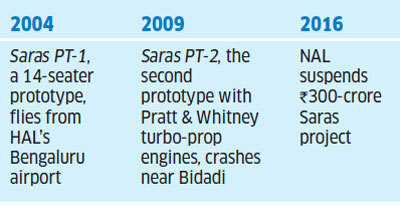 Even after the crash of Saras PT-2 in 2009, the Government of India continued its dream project for some time. By then, various stakeholders such as CSIR, Department of Defence Production and the Civil Aviation Ministry were not on the same page, resulting in a further slowdown of the project. Even after the crash of Saras prototype aircraft, we continued our efforts under a regional civil aviation project. It can now be reignited only if there¡¦s a clear ownership of it, with no turf war between government departments, says Nasim Zaidi, who first served as DGCA (2008-10) before getting elevated as secretary in the Ministry of Civil Aviation (2010-12). Maybe there will be less confusion now on who would pilot the new aeroplane project, after the government, in July last year, changed the allocation of business rules, allowing the Civil Aviation Ministry to pursue the development of commercial Aero-related manufacturing and its ecosystem, a subject that was handled by the Department of Defence Production. There's no doubt now who the pilot is. The only uncertainly is whether there will be a clear sky ahead.